Kwanza Osajyefo talks race, power, and politics in 'WHITE' – AiPT! The follow-up to 2016’s excellent BLACK, the series debuts in October. Say what you will about Kickstarter, but sometimes it works. For every person trying to fund a squirrel census, you get a dazzling success story in BLACK. The brainchild of writer Kwanza Osajyefo and designer Tim Smith 3, the series asked a simple but profound question: “In a world that already hates and fears them, what if only black people had superpowers?” The end result was a highly charged, exceedingly timely exploration of race, identity, politics, and the balance of power. 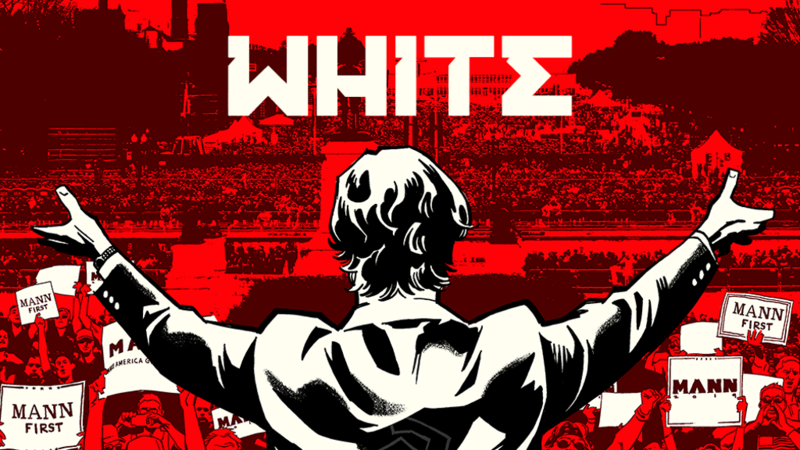 If the campaign is funded (as of publication, it’s sitting at $17,244 of a $39,999 goal, with 23 days to go), WHITE will be released in October. In the meantime, we caught up with Osajyefo via email to discuss life after BLACK, the influence of Trump politics, growth arcs for Kareem and Theodore Mann, and the book’s connection to Star Wars, among many other topics. AiPT! : What was the reaction to BLACK? Do you think you had accomplished the goals you’d set out to? Were there any sort of conversations or other treads surrounding the book that maybe surprised you? KO: The response to BLACK was overwhelming and almost 100% positive. The crowdfunding went far beyond any goals we had for the project. I think we were a bit surprised by the vitriol that came over a year after the campaign ended – but it soon became obvious that it was mostly haters. AiPT! : What’s the creative process been having worked with Smith, Roberson, and Sharpe once again? Do you think that sense of familiarity has had any impact on the art style or how you approach the writing? KO: Yes, and it has allowed us to push ourselves much farther than on BLACK. Tim’s character designs have dialed up the aesthetic of WHITE and really helped to bring things forward to inspire Jamal’s illustrations. Derwin and David Sharpe are just baller craftsmen and I can’t compliment their work enough. AiPT! : BLACK came out in 2016, right around the still early stages of this Trump-ian dystopia. Three years later, how much has that administration and its policies colored how you approach the world as it is in WHITE? KO: It’s weird because the central story for WHITE was set from the beginning, but I think, much like the cover to BLACK #4 (which was created well before the election), we’re drawing from history and human behaviors to evoke something that comes off looking predictive. That stated, the past few years have been an unfortunate wealth of source material to refine the story in WHITE. AiPT! : If this book is all about America’s reactions, what can we expect? Even without spoiling anything, what sort of country is America in the BLACK universe, and what has the existence of superpowers done to people’s sensibilities? KO: I think much like BLACK, it doesn’t stretch the imagination too much to consider how a country like the US would react. We’re a nation that has never come to terms with a very recent history of violent segregation, oppression, and slavery. Part of the point of WHITE is how uncomfortable parts of society are with having a “come to Jesus” about racial inequality in this country; the reactions range from dismissal to denial to outright anger. And that’s not even the racist portion – at least those segments wear it on their sleeves. AiPT! : Where is Kareem at now in his character arc? BLACK feels very much like an origin story, and now that he’s meant to operate as X, how’s he grown or matured? What can we expect from him in the duration of WHITE? KO: Kareem is now called X by the public and has become something of a poster boy for resistance against Mann’s administration. Because his power is essentially the ability to survive, he’s a one-man target to distract forces coming after empowered blacks. That ability has made him a little cocky because it’s been working so far, but things are about to take a turn at the beginning of WHITE. AiPT! : All great stories need a villain, and Theodore Mann seems especially effective. How does he change or evolve between the two books? He’s an obvious Trump stand-in, but what about him in WHITE that makes him further stand out or push the book’s emotional core? KO: Mann has always craved power – not wealth and access because he was born with those – what he considers real power is figuring out how only black people have superpowers. It’s confounded his family for all of its history and X has been the closest thing to a breakthrough, but the kid just keeps on curving him. So Mann is of the mind that if you can’t beat them, control or destroy them. AiPT! : You’d mentioned in another interview that the BLACK universe is a lot like the Star Wars trilogy. Is WHITE then this universe’s Empire? Does that mean we can expect a lot of suffering for our heroes (and maybe carbonite)? KO: I compare it in the sense that the stakes were higher in TESB and you had antagonists who were very much on the offensive. That is always an interesting point in a story, where the protagonists are really in a bad spot and may not win in the end. AiPT! : There’s a tendency in conservative circles to react to things like BLM with, “Well, what about what white lives?” I’m wondering how much of BLACK or WHITE is a reaction to this sentiment? To show people the absurdity of their ignorance by manifesting their worst “fears”? KO: It’s not. WHITE is more a context for what was the concept of BLACK. Racial inequality isn’t some outlier or event of the past – it has perpetrators, and I don’t think you can discuss the black experience without that frame of reference. AiPT! : BLACK had a ton of success via Kickstarter. How does that impact you and your fellow creators? Does it send a certain message to the industry, and do you think there’s more of a sustainable future/model through an online portal? KO: I think we were lucky in terms of theme, timing, and talent. But the industry is an old dragon that is slow to move. I don’t really think about that macro aspect of it because we’re so small by comparison. That we can tell these stories and successfully reach people is all that matters. But I do think moving online is key because while it doesn’t think physical books are going anywhere, there are signs of an actual shift in comics consumption. AiPT! : What do you think fans should or might take away from WHITE? How does this set things up for part three (your Return of the Jedi, if you will)? KO: That’s always hard because I think people take away what they bring to a piece of art. However, my ambition is to look at the concept of race and inequality from a wide and more contextual view that can hopefully provide a more honest look at these issues.